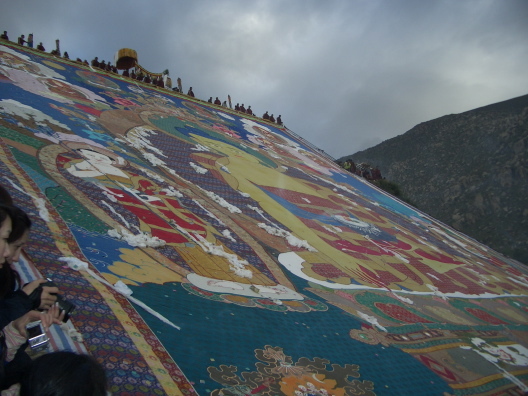 The thanka of the Great Buddha unveiled to mark the Tibetan beginning of the Shoton Festival in Lhasa (© 2009 IANS). Lhasa, Aug 30 (IANS) — As China officially ended the renovation of the palace that was the seat of the god-kings of Tibet when it was an independent Buddhist kingdom, the erasure of the image of the 14th Dalai Lama, who lived there from his formal enthroning in November 1950 till his flight to India in 1959, was virtually total. The 74-year-old (74-year-old) Nobel laureate, who remains a constant thorn in China’s flesh with his government-in-exile in India, is never mentioned by his name Jetsun Jamphel Ngawang Lobsang Yeshe Tenzin Gyatso in any of the hundreds of labels describing the thousands of exhibits visitors are allowed to glimpse. While the vice-premier from the central People’s Government of China, who had an audience with the Dalai Lama in 1956 in Potala Palace, has his name preserved for posterity through an exhibit label, Tenzin Gyatso has been reduced to a faceless entity. The position is the same at the Tibet Museum, showcased as Tibet’s first comprehensive modern museum and a must-visit for tourists. A key Chinese project for social development, the museum with over 30,000 exhibits is Beijing’s endorsement of the annexation of Tibet. The displays emphasise that since the founding of the Yuan dynasty in China in the 13th century, Tibet remained under the jurisdiction of China’s central government which assigned the General Administration as responsible for the political affairs of Buddhist monks across the country as well as the inhabitants in Tibet. The museum also highlights that the posts of the Dalai Lama and the Panchen Lama, the two topmost officials of theocratic Tibet, were formally assigned by the Qing government of China in 1653 and 1713 respectively. A key exhibit is the 17-point agreement signed between the local government of Tibet and China May 23, 1951, accepting measures for the peaceful liberation of Tibet and formalising the merger of the Buddhist kingdom with the communist republic. What it excludes though is that when the pact was signed, the Dalai Lama had already fled Lhasa to Yatung near the Indian border, readying to go into exile. At Lhasa’s oldest and most important temple, the Jokhang or House of the Buddha, built around 642, there is a photograph of the current Panchen Lama, the second-highest ranking lama after the Dalai Lama. It is actually the photograph of Gyancain Norbu, the boy chosen by the Chinese government in a controversial move to replace the nominee of the Dalai Lama, Gedhun Choekyi Nyima, who has since then vanished from public eye in Tibet. In the bustling markets outside temples in Lhasa, there are no photographs of the Dalai Lama, unlike markets in Nepal and India where the Tibetan diaspora live. In their household shrines or prayer rooms, Tibetans abroad keep photographs of the Dalai Lama before which they burn incense, light butter lamps and make offerings. But household shrines in Tibet are bereft of images of the popular red-robe-clad figure after China dubbed the Dalai Lama a separatist. The Government Information Office in Tibet issues booklets projecting China’s view of the Dalai Lama and his rule. They project a horrendous image of a pitiless feudal system where power and money remained concentrated in the hands of only five percent while the remaining were reduced to serfs and slaves. The pamphlets describe graphically how serfs would be punished: have their eyes gouged out, legs hamstrung, tongues cut out, or hands severed, hurled from a cliff, drowned or otherwise killed. They also describe how each Dalai Lama had two money-lending agencies that lent money at an exorbitant rate of interest to bleed the people dry. However, while the campaign has been effective in effacing the Dalai Lama’s image from Lhasa’s public life, it is questionable whether it has succeeded in uprooting the exile from Tibetan hearts. Every day, more than 1,500 Tibetans undertake a tour of the Potala Palace. And each day, hundreds of khadas – traditional silk scarves – pile up as offering before the empty throne of the Dalai Lama at the conference hall, once known as the Chamber of Golden Radiance.